Are you a teacher? Do you want to know how to build a classroom website for your class? Don't worry you don't have to go back to school to learn web design or coding. Using our site builder you can have your very own class website up and running in less than an hour. You have never made a website before and would like to try before you buy? We hear you. Thats why we give you 30 days to try build a classroom website free. Why Build A Classroom Website? Teachers and parents can communicate via the classroom website. Once parents have signed up they will become members and part of your list of followers that can receive emails from your website. When you use Easysite to manage your email list participants, you have the ability to automatically send out emails based upon updates to your class website. For example, you can use the calendar page to schedule reminders for certain school events. After you create a new school newsletter, you can use the "Share" feature to send out an email to all the parents that are followers. Most importantly, you can also use the built-in "Email Blast" page to send out customized emails to your website's email list participants. Scroll down to the bottom of this page where it says sign up. Next enter your details and press the blue get started button. That's it. You can now start to build your class website free for 30 days to see how it all works. After or at any time during the 30 day trial period make your first payment and will hook up a domain you already own or give you a free domain for life as long as you are with us. We will not hold your free classroom domain hostage if you decide to leave us. Just tell us where to transfer your school classroom domain and we will transfer it for free no questions asked. We have designed Easysite to be user friendly. No downloading and installing website building software. No installing plugins or scripts. No upgrades. From the moment you start building your class website you will see how easy it is to use. Choose your professional classroom website template, add a background, header and logo. You have full control of the look and feel of your site. Upload pictures, videos and text with our easy to use text editor that does all the coding for you. Web hosting is important. The more visitors your site gets the stronger your hosting needs to be. We only use clean, reliable fast hosting with a 99.99% up-time. This means your school classroom website will have no hosting problems. When you build your classroom website and make your first payment you can add a domain you aready own or get a free domain for life from us. We will point the domain at your website, as this can be confusing if you have never made a website before. We include a store page with every classroom website you build. This means that you can except payments on your class website for fees or even set-up a store and sell school books, new and second hand school clothes or pens, rubbers, rulers etc. 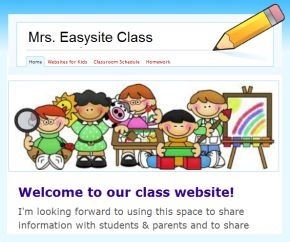 We are so confident that you will love Easysite that we want you to try build your classroom website free for 30 days. That's right use our site builder and create your website free for one month and see if its right for you. If you would like to speak to a expert before you sign up please feel free to contact us on help@easyite.com send a short email with your phone number and we will call you back with in twenty four hours. No credit card required, sign up below.